Because these excellent value drums have synthetic heads, they can be used in any weather, being unaffected by changes in temperature and humidity another bonus is that they are suitable for vegans, as they contain no animal products! Please note: these frame drums do not have rope handles on the back. The Remo Fiberskyn® 3 Frame Drum has a wide body shell and is provided with a thumb notch in the ACOUSTICON™ shell. All frame drums are equipped with a Remo drumhead and are manufactured with Remo’s patented ACOUSTICON™ shell that produce the same tonal characteristic found on traditional wood shell drums with excellent projection and enhanced low-pitched fundamentals. The results… the Remo frame drum is light weight, durable, weather-resistant and easy to play which means you’ll have countless hours jamming on your new instrument. 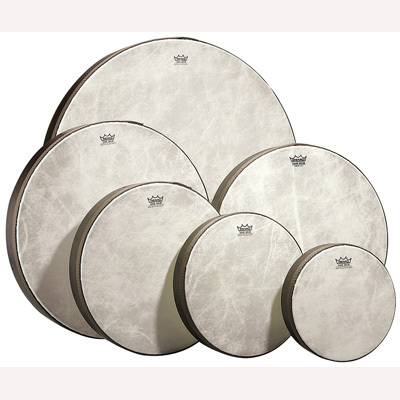 Because these excellent value drums have synthetic heads, they can be used in any weather, being unaffected by changes in temperature and humidity; another bonus is that they are suitable for vegans, as they contain no animal products!